My father-in-law passed away in February. The morning after his passing, my mother-in-law went into downsizing mode. She wanted all of her dearly departed husband's things out of her home. In her words, "These things are making me too sad. I don't want to live inside an altar. I have 60 years of good memories of him. That's all I need." Since my in-laws already lived pretty light in a small, one-bedroom apartment, my family initially thought that downsizing such a small space would be an easy task. We were so wrong. Finding new homes for all of my father-in-law's things turned into a two weeklong, full-time job for two people. Many of the hottest collectibles of the 20th Century, including Hummel figurines, Depression glass, Roseville pottery, comic books, baseball cards, lunchboxes, vintage denim, Happy Meal toys, and, of course, Beanie Babies, are worth just a fraction of their former values in the 21st Century. If your Hummel clown collection is your pride and joy, by all means, enjoy it. But if you are hoarding porcelain figurines so you can gift a clown portfolio to an unsuspecting relative with the belief that it will be a life-changing windfall, it might be better for everyone involved if you know the market value of each piece on eBay. I own a rhinestone brooch that has value because Lucille Ball was its original owner. If the brooch didn't have this famous provenance, it would be worth next to nothing. If I kick it tomorrow, my husband knows not to sell it at a garage sale. Get your valuables appraised and let your loved ones know of any back story with a particular "priceless" item. Don't forget about getting valuations for guns, record albums, and cameras. When my parents downsized 20 years ago, they made one call to their local resale store. The store owner showed up at my parent's house with a truck, loaded up all their old furniture, and wrote them a check on the spot. Sadly, this kind of one-stop un-furnishing no longer exists. Because two generations of people are downsizing simultaneously, thrift stores are crammed with merchandise. Even big charity shops are now placing limits on how much you can donate at one time. The main reason why it took us two weeks to divest my father-in-law's things is because we had to do a lot of legwork in order to find charities that would take donations. I supported myself for two years by trash picking furniture from the curb and reselling it at garage sales. Unfortunately, there are laws that thwart this type of industry in many communities. Pro Tip: To avoid hefty fines, check with your local government before curbing possessions or hanging up garage sale signs. If she didn't live in a swanky resort town, my mother-in-law could have simply dragged everything she didn't want out to the curb and left it for the taking, but her community has strict rules against dumping. Americans are especially good at using our possessions to tell our life stories, which explains our voracious appetite for vacation souvenirs, baseball bobblehead giveaways, and status purchases. Because we often use mementos as physical manifestations of our best memories, we tend to tremendously overvalue our things. Alas, sentimental value is subjective. In a way, my mother-in-law lucked out. Her home is full of nice things, so she got tremendous satisfaction out of the fact that we were ultimately able to find a home for pretty much everything she didn't want to keep. What she didn't get was cash. Shelves of books and DVDs were welcomed by her public library as donations, but worth next to nothing on half.com. My father-in-law shopped in the husky department, so all his gently used, retired rocket scientist clothes weren't sellable to consignment stores, but were snapped up by the local homeless shelter. With the advent of flat-screen TVs, the armoire they used as a TV cabinet languished on Craigslist before a neighbor took it off our hands to use as tool storage in his garage. The lack of income didn't bother my mother-in-law one bit. Fortunately, she doesn't need the money. More importantly, she just wanted the stuff out of her house and into the hands of people who would enjoy it. She had no expectation that the family would absorb her husband's old possessions into their own homes. 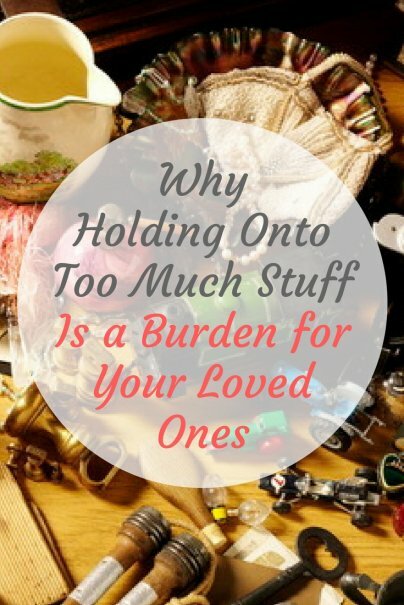 Because she made no assumption that her old belongings would have great monetary or sentimental value to anyone else, her downsizing story ended with everyone happy. She was able to achieve her goal, and her family was able to help her achieve it.